The microelectronics industry is growing at a substantial growth rate, attributed to technical advancements and growing demand for electronics across the globe which leads to high demand for ultra-pure water for microelectronic manufacturing. Highly purified water is essential in microelectronics industry for rinsing while manufacturing the electronics components. ITRS (International Technology Roadmap for Semiconductors) guidelines set the stringent water quality requirements on the microelectronics industry, which they have to necessarily comply with. Hence, there is a high demand for total carbon analyzer in the microelectronics industry. The pharmaceutical industry has a significant share in total carbon analyzer market for analyzing the water for injection, purified water, and water as a raw material for preparing various pharmaceutical formulations. The global pharmaceutical industry is growing a significant growth rate which leads to high demand for total carbon analyzers in the market. According to the secondary analysis done by Persistence Market Research, pharmaceutical industry segment contributed approximately one-third to global total carbon analyzer demand in 2016. Pharmaceuticals segment is expected to be highly attractive in comparison with other segments in the global total carbon analyzer market. Pharmaceuticals segment is projected to exhibit a value CAGR of 8.1% over the forecast period and account for 37.8% value share of the global total carbon analyzers market by 2026. Semiconductors segment is expected to account for 24.1% value share by 2026 and exhibit a CAGR of 8.2% over the forecast period. Waste water treatment segment is expected to account for 15.0% value share by 2026 and display a CAGR of 8.9% over the forecast period. Presently, total carbon analyzers are available with advanced features as a result of continuous innovation in this sector. For instance, total carbon analyzers with pump speed up-gradation developed for continuous monitoring of both liquid and solid samples in order to extract optimal intermittent analysis by reducing purging time have entered the market in North America. In addition, the users of total carbon analyzer can operate the analyzer present at different locations by using a new technique called on-line and real-time data analysis of solid and liquid samples. On-line and real-time data analysis of samples are the major revolutionary trends in total carbon analyzer market. Total carbon analyzers, which are capable of analyzing elements such as sulfur, nitrogen, and different types of carbon using both solid and liquid samples have higher demand in Western Europe region than conventional total carbon analyzers over the forecast period. 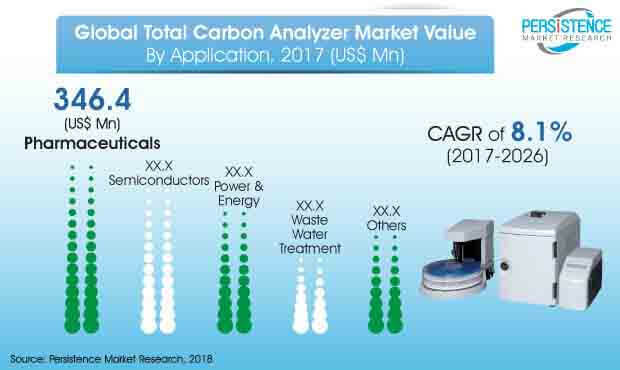 Total carbon analyzers with features such as on-line and real-time data analysis of samples, pump speed up-gradation, and optical technique have high demand in Western Europe which is boosting the total carbon analyzer market in the region over the forecast period. Saturation of total carbon analyzers in the global market is expected to restrain the global total carbon analyzer market over the forecast period. Total carbon analyzers come at a premium price with a long life cycle, therefore it not possible for any end user company to buy new total carbon analyzers just because of some minute technological advances. Also, the majority of end-user companies are maintaining total carbon analyzers due to strict regulations by the government bodies. This, in turn, results in restraining the demand of total carbon analyzers in the market.